1. Combine all the ingredients with a pinch of salt in a measuring jug, then pour into a medium-sized plastic or metal ice-cream container. Freeze, uncovered, for 1 hour, then use a fork to draw the frozen edges into the centre. Freeze for a further hour and rake through with the fork to create large crystals. 2. 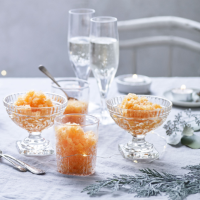 Repeat this process twice more (freezing for a total of 2 more hours) then serve in chilled glasses or cover with a lid and freeze for up to 4 weeks (rake the granita through with a fork before serving).